It's known that this church was used to be seed of an important monastery. Its dome is placed on eight round columns which form an irregular octagon. The part called as bema and the rest of the church were tried to be separated by keeping two of the columns separated from the walls. 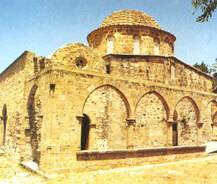 Considering its features this building is one of the finest of its kind in Cyprus which remained till today. The nartex part with barrel vaults on the west and the cloister arrangements on the south were added in 14th or 15th centuries. The cloister arrangement on the south is an unique example of gothic stone work. However, nothing left behind from the wooden upper-cover and the stone parapet made between the columns. Antiphonitis means "Replying Christ". The building in its original form was fully covered with wall paints (Frescos) instead of nartex. Most of these frescos have unfortunately disappeared. The Frescos can be dated in two different periods: 12th or 13th centuries and 14th or 15th centuries. Besides the Biblical themes, the frescos also describe the Saints. Moreover, although they couldn't survive till today, it's known that themes from the Old Testament were also described. Babtise of Christ, Birth of Mary, St. Symeon Stylites are among the wall paints which remained till today.